Creating an Instagram profile in 2018 is hard work. There’s more to consider than there’s ever been before. Whether that’s your Instagram goals, color scheme, or how often you’ll post, Instagram’s evolved into a series of complex decisions to represent who you are. Read on to find out how to create the perfect Instagram profile! The first part of your Instagram profile is your bio. Don’t underestimate the importance of the bio! This is the “back of the book blurb” for you as a person. In short, a bio should tell somebody who you are and what you do. 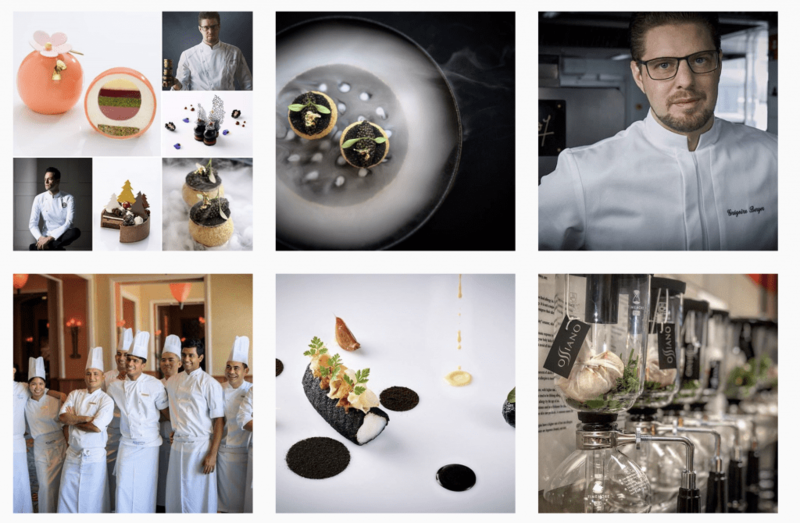 Take a look at celebrity chef Gregoire Ossiano’s Instagram profile. His bio clearly states his nationality, his current location and place of work, and his occupation. He has a contact e-mail and an external link. He even livens it up with some emojis! Ossiano’s feed delivers exactly what his bio promises: luxury photos of world-famous cuisine! Keep your bio light and short with a few identifying factors! That helps any potential followers get a clear idea of who you are. Something else important – and this is especially true for online businesses – is to mention your location! People want to know where you’re from and where you live. After all, they might want to calculate shipping costs. If people know where you are, that’s another area for them to connect with you! They could identify culturally or personally. In the best of cases, it can even lead to collaboration and beautiful friendship! Instagram is one of the best modern marketing tools. However, you still can’t buy a lot of things directly on Instagram. That means that Instagram serves a springboard to another online business or platform for most users. Youtubers, writers, and bloggers alike all have one thing in common: they never forget their links! Having a big Instagram following is great. But having that Instagram following engage with your other creations is even greater! Make sure you include a link to your platform so you don’t miss out on any Instagram business! Consider Ashley’s Instagram bio below. She’s a popular fashion Youtuber. She’s well known for her “thrift flips”, where she re-vamps clothing from thrift stores in the Nasty Gal vein. Ashley also has a great sense of humor, which is what keeps a lot of people coming back to her videos. Her bio clearly states her interests, occupation, and location, and links to her latest project! You might think that having a broad appeal is what’s valuable, but with Instagram, it’s actually quite the opposite. The more hyperfocused you are on your specialization, the more people are likely to follow you. Because most Instagram users follow accounts that focus on one type of content, the more you can zero in on the things that make you unique, the better. After you’ve accrued an audience, you can branch out.Artitsts will often concentrate on a particular style. Style bloggers might have an overall aesthetic they love. Travel Instagrammers will focus on a particular location or asset. Although he’s since left the profession, @poker_nomad grew his following by traveling the world while playing professional poker. His niche profession allowed him to amass a following of almost 7k. Narrowing down your interests to something unique and related to you will help you attract more followers who are interested in exactly what you’re posting. The Instagram feed is so important that the little picture in the right-hand corner is easily forgotten. But your Instagram profile picture is the FIRST thing a potential follower will see! There are a lot of good and bad ways to take an Instagram profile picture. Whatever way you choose, make sure that your profile picture reflects who you are. If you can relate it to your brand in some way, that’s even better. Make sure your Instagram profile picture matches your color scheme or aesthetic style. If your Instagram is related to an activity, show that activity! Your Instagram profile picture is a potential follower’s very first impression of you, so remember to pay attention to it! Take a look at special effects makeup artist Mimi Choi’s stunning Instagram profile picture. Mimi is known for her mind-bending illusion work, and her profile picture shows that off to great effect! It also uses the colors you most often see on Mimi’s profile. Her profile picture is eye-catching. It definitely makes you want to click through and look at more of her content! We all know that Louboutins are Louboutins because of a single, iconic red bottom. No matter the shoe, that’s the trademark. Well, it’s time to treat your Instagram like a Louboutin! Your unique aesthetic should be consistent! People like those easy signifiers – they know exactly whose content they’re looking at. In other words, your followers are looking for your signature as an artist. Useful apps such as Planoly can help you map out what a post will look like in your feed and what changes you might need to make to the photo. Anything as carefully curated as an Instagram feed deserves some true love and attention! Being consistent in your aesthetic will further cement your unique brand. People follow you for specific content, so give them what they’re there for! 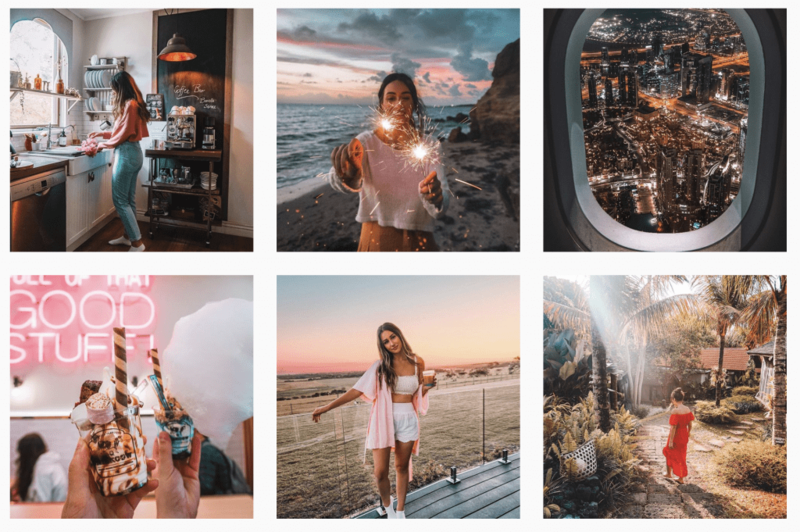 Angela is a travel & fashion blogger from Australia who gained a lot of popularity for her cute Instagram templates that swept the app last year. But Angela delivers – she has a charming, rustic aesthetic that makes her Instagram a delight to look at. Her colors are always bright and consistent. She favors soft pinks and blues, with muted highlights. You can tell right away when one of the photos is hers! But they’re not boring to look at. Even when it’s just a picture of her doing the dishes, she’s manages to make her Instagram feed look fun. An Instagram profile holds a lot of important factors in it. It’s the “About the Artist” section. Figuring out what to put in there can be hard enough. But figuring out what to put in there, and how to make it stand out – that’s nearly impossible. Your Instagram profile should give new followers a sense of who you are: what do you do for work, what’s your goal, and what’s your aesthetic? It should also mention where you are. External links can help you fund a passion or online business. Keeping your aesthetic consistent means you can build up a band of loyal followers. If your Instagram profile is consistent, visually interesting, and appeals to a certain interest, you’re in a much better position to gain followers quickly. Remember that an Instagram profile is just another form of art. Don’t forget to add your signature. Tip #8: Remember to Have Fun on Your Instagram Profile! Sure, you just read an entire article about how to stand out. But you should always keep in mind that if you aren’t enjoying your Instagram profile, there’s no point to it in the first place. Your Instagram is a place that gathers all of your interests and allows you to share what you love most with the world! Your Instagram profile is important as a business tool, but a business that doesn’t enrich your life isn’t a business worth having. You can always change things up if you decide you want to re-brand! Now you know all the secrets for creating a perfect Instagram profile. The only thing missing is you.